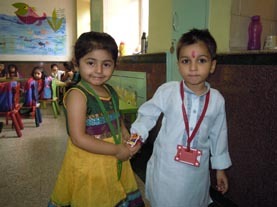 Celebrating and reaffirming the sibling bond where sisters tie a decorated thread or Rakhi on their brother’s wrist, Raksha Bandhan was celebrated on 1 August 2012 with much fervor and colour in K.R. Mangalam World School . Thanks to combined effort by teachers , parents, Principal. School succeeded in catalysing feeling of care and affection between students. Students meanwhile have gone ‘green’ with rakhis too. 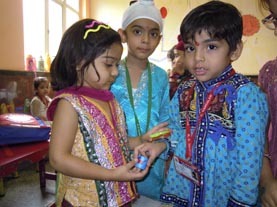 An inter-class rakhi making competition was held for the tiny-tots. The ‘green’ rakhi made by students of Class I with organic / waste material such as grass, apricots shell , raisins, cherries seeds, cloves and even chocolates found favour among students of K.R. 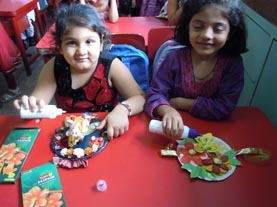 Mangalam Pre-Primary School to decorate their rakhis. 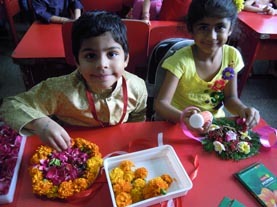 Every year students experiment with different material to make rakhis. 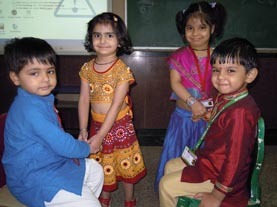 Students were found donning traditional attire during the day. Girls dolled themselves up in bandhanis, silk and netted outfits. Tying rakhi to boys which is a wonderful way of expressing warmth and love. Boys in return gave chocolates.